https://sep.yimg.com/ay/yhst-33477391359232/bubble-green-coral-physogyra-species-small-bubble-coral-octobubble-9.jpgBubble Green Coral - Physogyra species - Small Bubble Coral - OctobubbleEasyAggressiveYesCalcium, Strontium, Trace elementsIndo-PacifcCaryophylliidaeSmall 2" - 3"
Bubble Green Coral is one of the best Stony Corals for the reef aquarists to begin with. The interesting morphology and the easy maintenance of Bubble Green Coral qualify it for a marine aquarium. 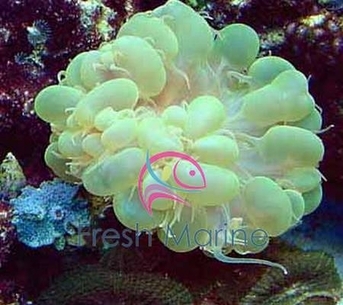 The article briefs you about some relevant aspects of Bubble Green Coral. The information should be helpful for you in case you are already dealing with Bubble Green Coral or are planning to deal with it in the near future. Other names: Bubble Green Coral belongs to the Family Caryophylliidae and the Genus Physogyra. The scientific name of Bubble Green Coral is Physogyra species. Bubble Green Coral is also commonly called as Small Bubble Coral, Pearl Grape Coral, Pearl Coral, Pearleye and Pearl Octobubble Coral. Coral Type: Bubble Green Coral is Large Polyp Stony (LPS) Coral. Origin or natural range: The Physogyra species originates from the Indo-Pacific region. Color: Bubble Green Coral occurs in green color. Morphology: As the name suggests, Bubble Green Coral has numerous small sized, round, retractable polyps which resemble the appearance of bubbles. When open, the polyps look like the shape of a bunch of balloons or of grapes. The polyps of Bubble Green Coral have long sweeper tentacles with the stinging cells, nematocysts, at their tips. Owing to nematocysts, the tentacles of the Physogyra species may sting anything that comes in their contact, be it any other coral, any marine invertebrate or even you. Compatibility: Bubble Green Coral is aggressive towards the other marine aquarium invertebrates. Temperature: The Physogyra species requires a temperature ranging between seventy-two and seventy-eight degrees Fahrenheit. Specific gravity: The specific gravity of the marine aquarium water containing Bubble Green Coral should be maintained within 1.023 to 1.025.
pH: The pH value should scale between 8.10 and 8.40. Illumination: Bubble Green Coral requires moderate lighting in the marine aquarium it inhabits. PC/VHO lighting is recommended for the Physogyra species. Water flow in the aquarium: Bubble Green Coral needs low to moderate water current in the marine aquarium it dwells in. Strong water current may hamper the spread of the Physogyra species. Marine aquarium habit & habitat: Place Bubble Green Coral between low to medium level in your marine aquarium. Give ample space to the Physogyra species so that it may stretch itself well. If obstructed by any coral in your aquarium, Bubble Green Coral may sting it. Feeding & Nutrition: The Physogyra species derives its nutrition chiefly through photosynthesis which is performed by zooxanthellae, a photosynthetic alga living symbiotically within the bubbles of the Physogyra species. Bubble Green Coral is Carnivorous in its feeding habit. The Physogyra species filter feeds a few times per week, when open. Bubble Green Coral may eat acellular marine invertebrates, meaty bits, shrimp brine, zooplankton and phytoplankton. Add Calcium, Strontium and the other trace elements in the water as dietary supplements for Bubble Green Coral. Care: Bubble Green Coral is easy to maintain. Bubble Green Coral may sting the other corals that obstruct the stretching of its long sweeper tentacles. Therefore, keep the other corals away from Bubble Green Coral in your aquarium. When open, the sweeper tentacles of Bubble Green Coral may sting anything that touches them, even you. Therefore, be very careful while handling Bubble Green Coral if its sweeper tentacles are open.